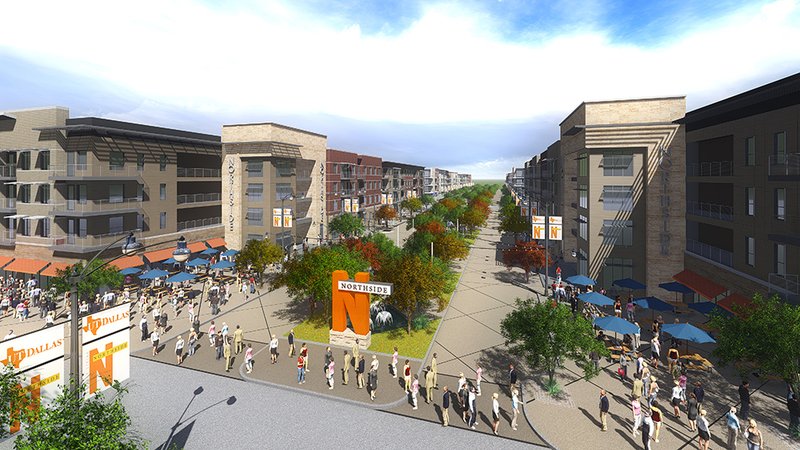 A rendering shows what the Northside development may look like. Construction has begun at a major mixed-use development in Richardson that may include a new DART station. The Northside development is northwest and adjacent to the University of Texas at Dallas campus in Richardson near the President George Bush Turnpike and North Central Expressway. With approximately 370,000 square feet, Northside will offer 20,000 square feet of retail space and 600 beds through a mix of one-, two-, and three-bedroom apartments and 16 two- and three-bedroom townhomes. A parking garage, surface parking lot and residential amenities, such as a pool and dog park, are also expected. The central “spine” of the development is planned to provide a park-like pedestrian mall that can be closed off to accommodate events. This development is notable to DART because it could be the location of a future Cotton Belt Rail Corridor station or stop. This project is part of DART’s 2030 Transit System Plan. The development is expected to be completed by Fall 2016. Read more about the development at the UTD News Center. This entry was posted in Economic development, News bits. Bookmark the permalink.